Ten Jinn have taken upon themselves a monumental task. It’s one thing to do a cover song of a famous artist and quite another to do an entire album covering that one artist. And when the artist being covered is someone as huge as David Bowie, the mountain to climb looks pretty forbidding. Additionally, when that artist has recently left us and everyone is quite likely wanting to do tributes but at the same time perhaps having second thoughts about touching the sacred shrine so soon, there’s every reason to leave the notion well alone. Ten Jinn, however, have boldly decided to pay their respects to Mr. Jones by following their hearts and recording an album entirely of Bowie covers. They say that the best way to do a cover song is to either make it totally your own and arrange it in a completely different style (as Deep Purple used to do with Beatles‘ songs) or to strike that delicate balance between capturing the original song’s motif and its appeal while simultaneously putting the covering band’s own stamp on it. I have never been a Bowie fan (I totally respect his talent and what he gave to popular music but I just never became a fan) but I am familiar with many of his hit songs. 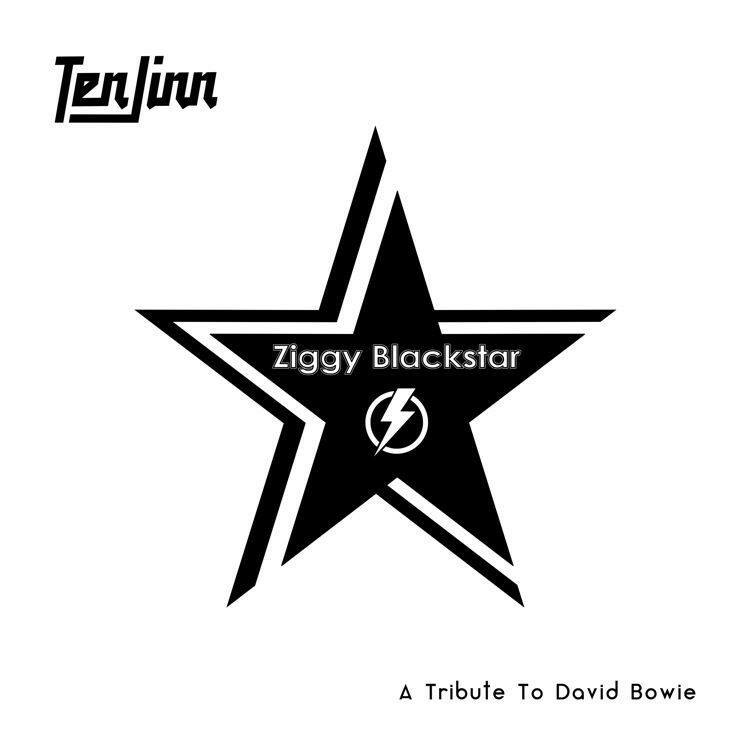 So it’s very interesting for me to hear what Ten Jinn has achieved with their Ziggy Blackstar album because I can hear the Bowie in the music, and even at times in the vocals, but at the same time these songs sound fresh and new to me. Some of the songs Ten Jinn have covered are unfamiliar to me so they sound like new material, and if asked for my opinion I might say that they have a Bowie-esque quality to them. Vocalist John Paul Strauss manages to affect some very close Bowie-isms but never sounds like a hopeful mimic. He is confident in his own voice and that’s one of the reasons the songs come across not as copycat tribute songs but as interpretations by John Paul Strauss and Ten Jinn. The music nearly all sounds original to me. I don’t know most of the original songs well enough to say how close Ten Jinn‘s versions are to the originals, but from my perspective, they have gone ahead and arranged the music to their capabilities and once again I am hearing fresh new music. I admit I was surprised by the album opener “I’m Afraid of Americans” because that is one Bowie song I have always really liked thanks to Trent Reznor‘s involvement. During the first listen to Ten Jinn‘s version I felt that they made a valiant effort but could not beat the original. But after the second listen I changed my view. They still can’t beat the original but what they have done with the song is, once again, made it their own and in the end, their result is a stand-alone effort. It’s like when you hear Paul McCartney praise a band for their personal take on a Beatles cover; I think Mr. Jones would have approved. Other moments that caught my attention were the insane piano solo in “Aladdin Sane” (I don’t know if that’s in the original but it’s very cool here) and the surprising (to me) intro to “Future Legend” because it sounds so Ayreon. Basically, I’ll say this: Ten Jinn‘s album sounds great to someone who does not have a deep familiarity with David Bowie‘s music. It can be enjoyed as an album on its own. Bowie fans might be more critical and zero in on details that go past me. But I think Ten Jinn have done a splendid job of doing an album entirely of Bowie cover songs. They struck the right balance between tribute and originality.